Dog Kennel Roof: Pets stay cooler, cleaner, drier, healthier, and happier with a roof over their head. This kennel roof system has a galvanized steel frame and white poly tarp rain cover prepackaged in a box. 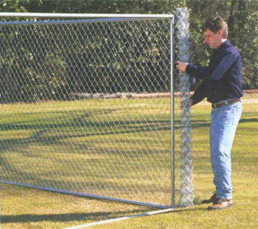 All components needed for assembly and attachment to kennel are included. We strongly recommend an Anchor Kit be installed with the kennel roof (anchor kit not included with this roof system). No picture available for this roof system.